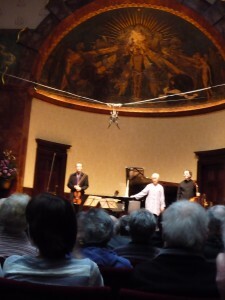 Here’s the Florestan Trio on stage at Wigmore Hall at the end of our Monday lunchtime concert. It was broadcast live on Radio 3 and will be repeated this Saturday 19 March at 2pm. It’s also available this week on iPlayer. It’s always a delight to play at Wigmore Hall, and the quality of the audience’s rapt attention is inspiring. Just to play such a fine (and finely-maintained) piano as the Wigmore’s Steinway always gives me fresh ideas in performance about what could be done with tonal variety. It’s also fun to bump into visiting international artists backstage. On this occasion I overlapped in a practice room with fellow pianist Joseph Kalichstein who was due to appear in the Wigmore with his own long-standing trio with Jaime Laredo and Sharon Robinson. We had a brief but deeply satisfying chat about what it is like to be the pianist in a piano trio. This entry was posted on Wednesday 16th March 2011 at 10:15am	and is filed under Concerts, Florestan Trio, Musings. You can leave a response, or trackback from your own site.